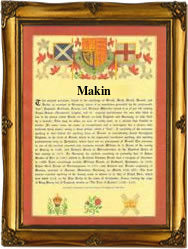 This interesting surname, with variant spellings Makin, Maykin, Meakin, Meaken and Making, has two origins. Firstly, it is a diminutive of May, a pet form of the Middle English given name "Matthew", itself coming from the Hebrew male personal name "Matityahu", meaning "Gift of God", recorded in the Greek New Testament in the form "Matth(a)ias". Secondly, it may be from a nickname, derived from the Middle English "maid(en)", meaning girl, young woman, and the diminutive suffix "-kin"; hence, "little maid". The surname dates back to the late 13th Century (see below), and further early recordings include: Peter Maykyn in the 1319 Feet of Fines of Essex, and Robert Maidekyn (1327), the Place Names of Kent. Recordings from London Church Registers include: the christening of Roger Makin on November 28th 1561, at St. Botolph's, Bishopsgate, and the christening of Richard Makin on August 29th 1565, at St. Thomas the Apostle. Bathsua Makin (flourished 1673), was the most learned Englishwoman of her time; she was tutoress to Charles 1's daughters and wrote on female education. The first recorded spelling of the family name is shown to be that of Henry Maykin which was dated 1273, in the "Hundred Rolls of Cambridgeshire", during the reign of King Edward 1, known as "The Hammer of the Scots", 1272 - 1307. Surnames became necessary when governments introduced personal taxation. In England this was known as Poll Tax. Throughout the centuries, surnames in every country have continued to "develop" often leading to astonishing variants of the original spelling.